Jacob Joseph Arrieta (born March 6, 1986) is an American professional baseball pitcher for the Chicago Cubs of Major League Baseball (MLB). He previously played for the Baltimore Orioles. 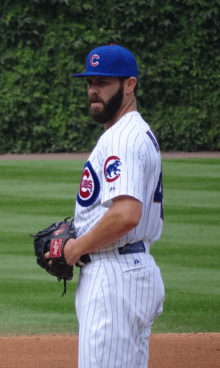 In 2015, Arrieta won the National League Cy Young Award, was the MLB wins leader, pitched a no-hitter, and set a major league record at 0.75 earned run average (ERA) for the lowest second-half ERA. Arrieta's 2015 season has been widely compared to Bob Gibson's 1968 season in which Gibson won the National League MVP and Cy Young Awards after posting a live-ball era record 1.12 ERA. On April 21, 2016 Arrieta threw his second no-hitter, against the Cincinnati Reds, the only one of the 2016 regular season. Born in Farmington, Missouri, Arrieta grew up in Plano, Texas, and attended Plano East Senior High School. As a high school senior he was selected by the Cincinnati Reds in the 31st round of the 2004 draft, but instead chose to attend college. He attended Weatherford Junior College for his freshman year posting a 6–2 win-loss record with a 3.58 earned run average (ERA). Following his freshman year, Arrieta was selected by the Milwaukee Brewers in the 26th round of the 2005 Major League Baseball draft but instead opted to transfer to Texas Christian University where he played for the Horned Frogs baseball team for his sophomore and junior seasons and studied sport psychology. During the summer of 2005, prior to enrolling at TCU, Arrieta participated in summer collegiate baseball with the McKinney Marshalls of the Texas Collegiate League and posted a 4–3 record in 10 starts with a 1.87 ERA over 62.2 innings pitched. During his sophomore year, Arrieta led college baseball with 14 wins and had a 2.35 ERA over 19 appearances. He also won the Mountain West Conference Pitcher of the Year award and was named a Second-Team College Baseball All-American after his sophomore year. Arrieta first joined the United States national baseball team in 2006 and helped the team win the World University Baseball Championship in Cuba. He was 4–0 with 34 strikeouts and a 0.27 ERA—allowing just one earned run in 35 innings pitched over six starts for the team. In his first start at the 2008 Summer Olympics, Arrieta pitched six innings and struck out seven in Team USA's 9–1 victory over the China national baseball team. Arrieta was selected by the Baltimore Orioles in the fifth round of the 2007 Major League Baseball draft and received a $1.1 million signing bonus, which at the time was the largest signing bonus for a fifth round draft pick. Arrieta made his professional debut in the Arizona Fall League with the Phoenix Desert Dogs in 2007. He posted 16 scoreless innings, while striking out 16 over 14 appearances, and helped lead the Desert Dogs to the Arizona League championship. Arrieta was 6–5 with a 2.87 earned run average and 120 strikeouts over 113 innings for the Frederick Keys of the Class A-Advanced Carolina League when his season ended in order to allow him to play for the USA Baseball team at the 2008 Summer Olympics in Beijing. Arrieta made his major league debut on June 10, 2010, against the New York Yankees at Camden Yards. He pitched six innings, giving up four hits and three runs, striking out six and earning the win. He started the home openers for the Orioles in 2011 and 2012. Both starts resulted in victories for the Orioles. After starting the 2012 season 3–9 with an ERA of 6.13, Arrieta was demoted to Triple-A on July 6, 2012. 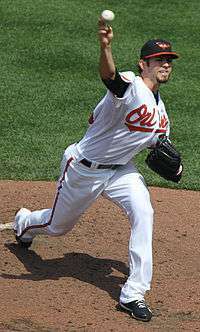 Arrieta began the 2013 season with four starts for the Orioles posting a 1–1 record and a 6.63 ERA until being sent down to the Triple-A Norfolk Tides on April 22, 2013 after the Orioles recalled Alex Burnett. He was recalled by the Orioles on May 18, and then later optioned back down to Triple-A to make room for Kevin Gausman on May 23. He was recalled again on June 14 and Gausman was optioned to Triple-A to make room on the roster for Arrieta. Through four years with the Orioles, Arrieta posted a record of 20–25 and a 5.46 ERA. On July 2, 2013, the Orioles traded Arrieta along with Pedro Strop to the Chicago Cubs for Scott Feldman and Steve Clevenger. He was optioned to the Iowa Cubs of the Class AAA Pacific Coast League upon being acquired. After making 5 starts for Iowa, Arrieta was recalled to start Game 2 of a doubleheader against the Brewers on July 30. In his Chicago debut, he gave up 1 run in 6 innings, earning a no-decision in the 3–2 loss. After the game, Arrieta was optioned to Iowa where he made 2 more starts before being recalled on August 14 to replace Carlos Villanueva in the rotation. He made eight more starts before the end of the season. In his nine starts with Chicago, he went 4–2 with a 3.66 ERA, striking out 37 in 51.2 innings. In 30 games (29 starts) in 2013 including the minors, Arrieta went 12–9 with a 4.42 ERA, striking out 137 in 154.2 innings. Three times in 2014 he took no-hitters into the seventh or eighth innings. On June 24, Arrieta retired the first 18 Reds in order, but the perfect game was broken up by Cincinnati's Billy Hamilton's leadoff double in the seventh. On June 30, 2014, against the Red Sox, Arrieta took a no-hitter into the 8th until Stephen Drew singled to lead off the inning. As of September 24, 2014, he had posted a 10–5 record with a 2.53 ERA. In 156.2 innings he gave up 114 hits, walked 41, and struck out 167. On July 12, 2015, Arrieta pitched a complete game victory over the Chicago White Sox at Wrigley Field, his second complete game of the season and the third of his major league career. On August 20, Arrieta became the first MLB pitcher to win 15 games in the 2015 season. Ten days later, Arrieta no-hit the Los Angeles Dodgers at Dodger Stadium for the 14th no-hitter in Cubs history. He struck out 12 batters, including all three batters he faced in both the first and ninth innings. Sandy Koufax had been the last pitcher to complete a no-hitter by striking out all three batters he faced in the ninth inning, doing so against the Cubs in his 1965 perfect game—a game also played at Dodger Stadium. Arrieta was named the NL Player of the Week for August 24–30 and NL Pitcher of the Month for August with a 6−0 and a 0.43 ERA and the no-hitter. The right-hander held opposing hitters to a .130 batting average and a .196 on-base percentage in August and struck out 43 batters while walking just 10. On September 22, Arrieta won his 20th game of the season, throwing a three-hitter against the Brewers. With 11 more strikeouts in that 4-0 Cubs victory at Wrigley, he was the first MLB pitcher to win 20 games this season and had his 4th complete game and 3rd shutout of the season. After the 2015 All-Star break, he gave up 9 earned runs during 15 starts over 107 1/3 innings for a 0.75 ERA, the lowest in MLB history in the second half. For the season, Arrieta's 22–6 record and 1.77 ERA made him only the fifth pitcher to win at least 22 games with no more than six losses and a sub-2.00 ERA since the earned run became an official stat in 1913. On October 5, he was again named NL Pitcher of the Month for his 4–0 September record with a 0.45 ERA. Arrieta pitched a complete-game shutout, striking out eleven batters and allowed only four hits to defeat the Pittsburgh Pirates 4–0 in the 2015 National League Wild Card Game. He became the first pitcher to post a postseason shutout while striking out at least 10 batters and walking zero. He is also the first pitcher to have more stolen bases than runs scored in a postseason game when he stole second base in the top of the 7th. Arrieta was the pitcher of record in the Game 2 loss of the 2015 National League Championship Series to the New York Mets. On November 18, 2015, Arrieta won the NL Cy Young Award to become the first Cubs pitcher to do so since Greg Maddux in 1992. He is the fifth Cubs winner overall, also joining Fergie Jenkins (1971), Bruce Sutter (1979) and Rick Sutcliffe (1984). On February 5, 2016, Arrieta and the Cubs agreed on a record arbitration deal worth $10.7 million 2016 salary, the largest one-year contract for a second-time arbitration eligible pitcher, topping David Price's $10.1 million salary in 2013. The club chose him as the 2016 season Opening Day starting pitcher against the Angels on April 4, 2016. On April 21, 2016, Arrieta pitched his second career no-hitter and the 15th no-hitter in Cubs history against the Cincinnati Reds in a 16–0 blowout win. He walked four and struck out six. Arrieta, who at the time of the no-hitter had not recorded a loss in his last 17 regular-season starts, became only the second MLB pitcher ever to go unbeaten (in regular-season play) between no-hitters, with the only other being Johnny Vander Meer, who threw consecutive no-hitters in 1938. The Arizona Diamondbacks defeated Arrieta and the Cubs 3–2 on June 5, even with 12 strikeouts in his first five innings, stopping a 20-game regular season winning streak and giving him his first loss in 11 months. In Game 3 of the 2016 NLDS, Arrieta hit a three run home run off of San Francisco Giants' pitcher Madison Bumgarner, the first time that a pitcher hit a home run off of Bumgarner, which ended Bumgarner's consecutive playoff scoreless innings streak, of over 24 innings. Arrieta won Game 2 and Game 6 of the 2016 World Series. The Cubs won Game 7 of the series 8-7 in 10 innings, giving them their first World Series title after a 108-year long drought. Arrieta lives in Austin, Texas, during the offseason with his wife, Brittany, and their two children, Cooper and Palmer. He is known as a "workout freak" and uses cross-training in his workouts. Arrieta does pilates and incorporates kale juice, nuts, and fruits into his diet. His maternal grandfather is of Puerto Rican ancestry whose parents are from the Basque Country, while his paternal grandmother is of Italian ancestry. Arrieta served as a groomsman for former TCU teammate Matt Carpenter's wedding on December 10, 2011. ↑ Greenberg, Jon (November 19, 2015). "NL Cy Young winner Jake Arrieta finally put 'small things in place'". ESPN. Retrieved November 19, 2015. ↑ Perry, Dayn (October 3, 2015). "Cubs' Jake Arrieta sets record with 0.75 ERA in second half". CBS Sports. Retrieved November 19, 2015. ↑ Posnanski, Joe (October 8, 2015). "CHANNELING BOB GIBSON". NBC Sports. Retrieved November 19, 2015. ↑ Gonzales, Mark (September 22, 2015). "Cubs' Jake Arrieta receives Cy Young endorsement from Joe Maddon". Chicago Tribune. Retrieved November 19, 2015. ↑ Berg, Ted (September 23, 2015). "Cubs ace Jake Arrieta is 9-0 with a 0.48 ERA since the start of August". USA Today. Retrieved November 19, 2015. ↑ Ogden, Rob (September 29, 2015). "Jake Arrieta has the second-best 19-game ERA since 1914". Chicago Sun-Times. Retrieved November 19, 2015. ↑ Keri, Jonah (October 12, 2015). "The Sudden, Historic Dominance of Jake Arrieta". Grantland. Retrieved November 19, 2015. ↑ "The secret pitch that ignited Jake Arrieta's career". New York Post. October 18, 2015. Retrieved November 19, 2015. 1 2 3 4 5 6 7 8 "Jake Arrieta". TCU Athletics. ↑ "MLB 2004 Draft selections, Day 2". ESPN. June 8, 2004. Retrieved August 31, 2015. 1 2 Muskat, Carrie (February 22, 2015). "Strong body and mind fuel Cubs' Arrieta". MLB.com. Retrieved August 31, 2015. ↑ "Arrieta named NCBWA preseason 1st-team All-American". TCU Athletics. November 15, 2006. Retrieved August 31, 2015. ↑ "TCU Athletics". Retrieved August 18, 2008. ↑ "More tension than expected in U.S. win". Retrieved August 18, 2008. ↑ "Minor League Baseball". Retrieved August 18, 2008. ↑ O'Brien, Ben (August 7, 2008). "Arrieta To Live Olympic Dream". Plano Star Courier. Retrieved August 31, 2015. 1 2 LeBlanc, Jay (June 5, 2008). "Prospect Q ;amp& A: Jake Arrieta, Orioles". Washington Times. Retrieved February 10, 2016. ↑ Miller, Harrell (November 24, 2007). "Another banner year for Desert Dogs". Napa Valley Register. Retrieved February 10, 2016. ↑ Reina, Christopher (March 9, 2009). "Prospect Report: Jake Arrieta, Baltimore Orioles". RealGM. Retrieved February 10, 2016. ↑ "Two Former NJCAA Baseball Players Named to USA Olympic Team". NJCAA. July 25, 2008. Retrieved February 10, 2016. ↑ "O's Arrieta beats Yankees in MLB debut". Baltimore Orioles. Retrieved August 31, 2015. ↑ "Transactions". Baltimore Orioles. Retrieved August 31, 2015. 1 2 "Orioles option rookie Gausman, recall Arrieta". USA Today. June 14, 2013. Retrieved February 10, 2016. ↑ Aderhold, Nathan (April 22, 2013). "Orioles demote Jake Arrieta to Triple-A, recall Alex Burnett". SB Nation. Retrieved February 10, 2016. ↑ Encina, Eduardo (May 24, 2013). "Jake Arrieta sent back to Triple-A to make room for Gausman". Baltimore Sun. Retrieved February 10, 2016. ↑ Connolly, Dan (June 14, 2013). "Orioles notes: Gausman not guaranteed to return to majors soon". Baltimore Sun. Retrieved February 10, 2016. ↑ Gonzalez, Anthony (July 2, 2013). "Orioles Trade Jake Arrieta, Pedro Strop To Cubs, Who Shipped Carlos Marmol To Dodgers". Huffington Post. Retrieved February 10, 2016. ↑ Reynolds, Drew. "Orioles Trade Jake Arrieta and Pedro Strop to Cubs for Scott Feldman". bleacherreport.com. bleacher report. Retrieved October 8, 2015. ↑ Randhawa, Manny (July 31, 2013). "Cubs falter after Arrieta's strong debut". MLB.com. ↑ Rogers, Phil. "Arrieta looks like pitching cornerstone for Cubs". MLB.com. Retrieved September 18, 2014. ↑ "Jake Arrieta takes no-hit bid into 8th as Cubs blank Red Sox". ESPN. August 1, 2014. Retrieved September 9, 2015. ↑ Muskat, Carrie; Garno, Greg (July 12, 2015). "Arrieta goes distance, goes deep in 10th win". MLB.com. Retrieved July 12, 2015. ↑ "Jake Arrieta masterful as Cubs avoid sweep vs. White Sox". CSNChicago.com. July 12, 2015. Retrieved July 12, 2015. ↑ Bowman, Mark; Muskat, Carrie (August 21, 2015). "Arrieta first to 15 wins as Cubs rout Braves". MLB.com. Retrieved August 24, 2015. ↑ "Chi Cubs at LA Dodgers – 2015-08-30 – Major League Baseball – Yahoo! Sports". Yahoo! Sports. August 31, 2015. Retrieved August 31, 2015. 1 2 Press release (September 3, 2015). "Jake Arrieta of the Chicago Cubs named National League Player of the Week". MLB.com. Retrieved September 23, 2015. 1 2 3 Fordin, Spencer (September 3, 2015). "Arrieta named NL Pitcher of the Month: Right-hander goes 6-0 with 0.43 ERA in August, capping month with no-hitter". MLB.com. Retrieved September 23, 2015. ↑ Garno, Greg; Jackson, John (September 22, 2015). "Arrieta, Bryant make history in Cubs' win". MLB. Retrieved September 23, 2015. ↑ Muskat, Carrie (October 4, 2015). "Jake Arrieta to start NL wild card game". MLB.com. Retrieved October 5, 2015. 1 2 "Cubs superhuman ace Jake Arrieta wins consecutive NL Pitcher of the Month". csnchicago.com. CSN CHGO. Retrieved October 6, 2015. ↑ "Chc vs Pit 10/07/2015 Boxscore". mlb.mlb.com. MLB.com. Retrieved October 8, 2015. ↑ Casella, Paul. "10 cool facts about Arrieta's Wild Card shutout". m.mlb.com. MLB.com. Retrieved October 8, 2015. ↑ Woo, Jeremy. "Dallas Keuchel, Jake Arrieta named AL, NL Cy Young Award winners". si.com. Sports Illustratedsi.com. Retrieved November 19, 2015. 1 2 3 Rogers, Jesse (November 18, 2015). "Jake Arrieta wins NL Cy Young to continue Cubs' awards run". ESPN. Retrieved November 18, 2015. ↑ Perry, Dayn. "Cubs Arrieta breaks record with $10.7 million dollar contract". cbssports.com. CBS Sports. Retrieved February 7, 2016. 1 2 Muskat, Carrie (April 1, 2016). "Arrieta carries great expectations into Opening Day". MLB.com. Retrieved April 1, 2016. ↑ "Jake Arrieta no-hits Reds in blowout win for the Cubs". ESPN.com. Retrieved April 22, 2016. ↑ "Jake Arrieta in a league of his own when it comes to numbers, no-hitters". ESPN.com. April 21, 2016. Retrieved April 22, 2016. ↑ Kuc, Chris (June 5, 2016). "Jake Arrieta's 20-game winning streak ends on strange Sunday at Wrigley". Chicago Tribune. Retrieved June 11, 2016. 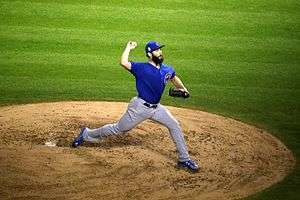 ↑ "Arrieta keeps Indians in check as Cubs force Game 7". ESPN.com. Retrieved November 3, 2016. ↑ Bastian, Jordan; Muskat, Carrie. "Chicago Cubs win 2016 World Series". MLB. Retrieved November 3, 2016. ↑ Breen, J. P. (July 1, 2014). "The Buyer's Guide Jake Arrieta". Baseball Prospectus. Retrieved August 31, 2015. ↑ Eno Sarris (March 18, 2015). "Jake Arrieta's One-Grip Multi-Slider". Fangraphs. Retrieved September 15, 2015. ↑ "Player Card: Jake Arrieta". Brooks Baseball. Retrieved July 18, 2014. ↑ Muskat, Carrie (December 1, 2014). "Family matters: Arrieta doesn't prepare alone". MLB Advanced Media. Retrieved February 9, 2016. ↑ Rogers, Phil (September 22, 2015). "'Workout freak' Arrieta only getting stronger". MLB Advanced Media. Retrieved February 9, 2016. ↑ Gonzales, Mark (February 8, 2016). "Jake Arrieta preparing for heavy workload, but Cubs would be fine with less". Chicago Tribune. Retrieved February 9, 2016. ↑ Krest, Shawn (March 28, 2015). "Cubs' Jake Arrieta changing diet, workout routine". CBS Sports. Retrieved February 9, 2016. ↑ Gonzales, Mark (March 28, 2015). "Cubs' Jake Arrieta believes healthier diet will pay off during season". Chicago Tribune. Retrieved February 9, 2016. ↑ Muskat, Carrie; Langosch, Jenifer (October 10, 2015). "Arrieta–Carpenter bond faces playoff test: Stomping grounds: Friends always pushed each other in college". MLB.com. Retrieved May 27, 2016. ↑ "Every Baltimore Orioles Opening Day Starter & Result". CBS Baltimore. April 6, 2015. Retrieved November 19, 2015. 1 2 3 4 5 "Jake Arrieta MLB Profile". MLB. 2015. Retrieved November 19, 2015. ↑ "Rosters for Futures Game 2008 official". CBS Sports. June 28, 2008. Retrieved November 19, 2015. ↑ Rode, Nathan (June 27, 2008). "Carolina League Takes Midseason Showdown". Baseball America. Retrieved November 19, 2015. ↑ Fit, Aaron (June 13, 2006). "2006 College All-America Team". Baseball America. Retrieved November 19, 2015. ↑ "NCBWA ANNOUNCES 2006 PRO-LINE CAP/NCBWA DIVISION I ALL-AMERICA TEAMS" (PDF). NCBWA. June 13, 2006. Retrieved November 19, 2015. ↑ "Division I Baseball Records" (PDF). NCAA. 2010. Retrieved November 19, 2015. ↑ "Stephen Curry, Jake Arrieta collect first awards at ESPYS". ESPN. July 13, 2016. Retrieved July 13, 2016. Wikimedia Commons has media related to Jake Arrieta.